Another skimpy post this week…………………. I am at a loss to where my days go, and so quickly too. This entry was posted in art, drawing, Drawing a Day, Draws Shoots and Leaves and tagged a drawing a day, colored pencil, coloured pencil, pencil, plants on September 16, 2015 by Draws Shoots and Leaves. 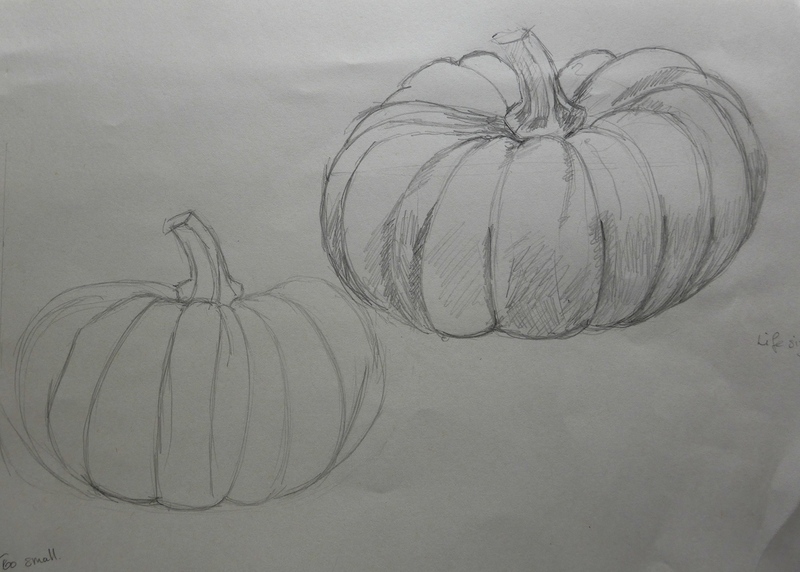 Started the week having a go at some pumpkins, they are satisfying to sketch with their lovely round forms. 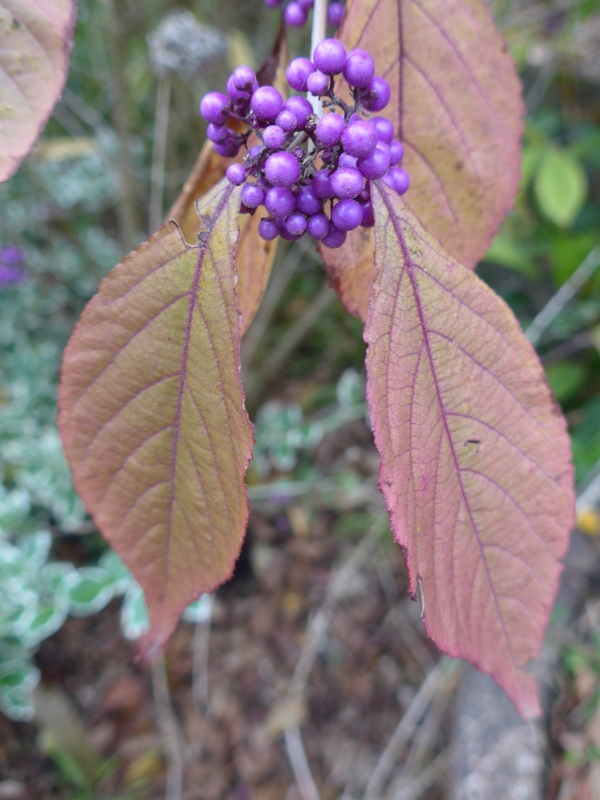 Then my eye was caught by a Callicarpa growing in the garden, it catches my eye and my attention every year because of the glorious colour of the berries, its common name is ‘beauty berry’ and I understand why. 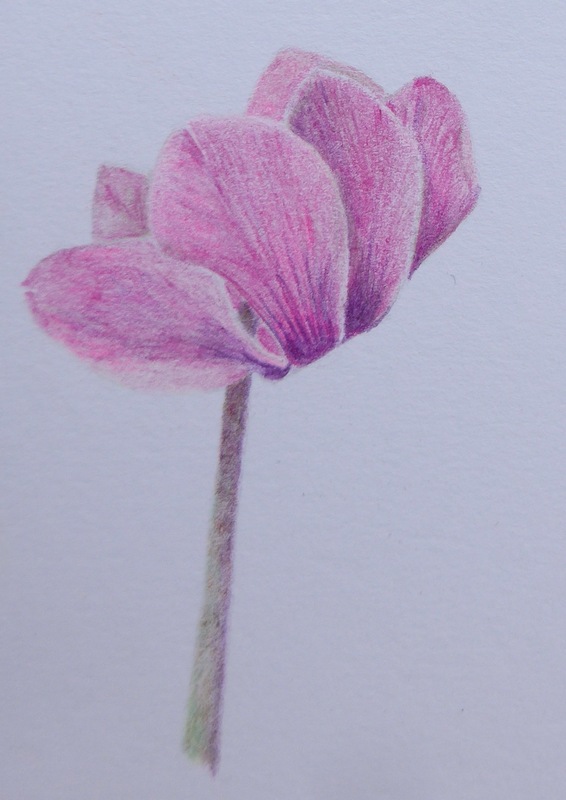 I decided to make this the subject of my next coloured pencil drawing….. a great excuse to use the purples that have been lurking around unused since I tried a Cerinthe back in the spring. Lush! A close up of how it is progressing. 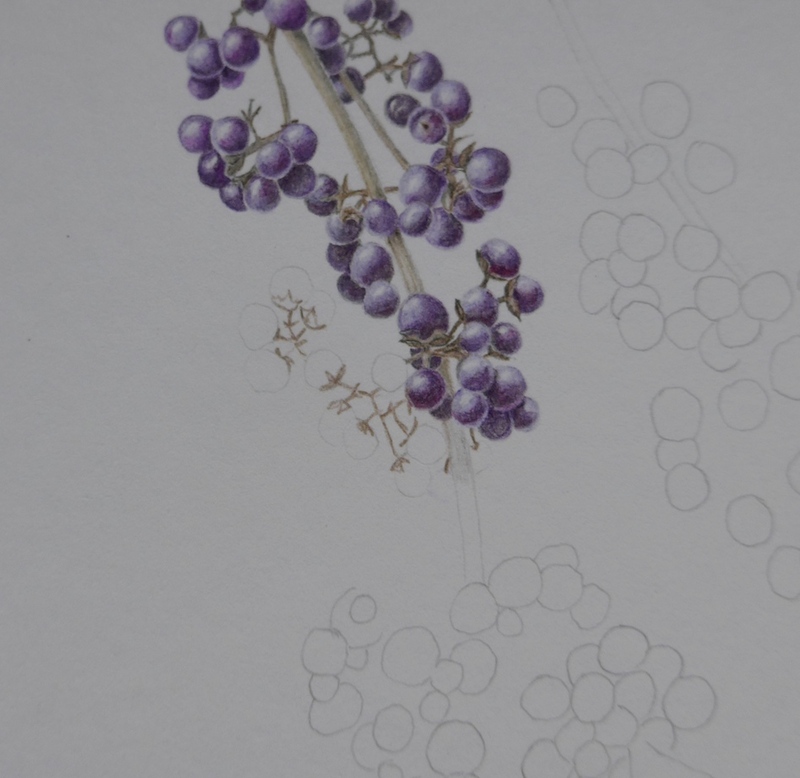 This entry was posted in art, botancial art, Draws Shoots and Leaves, plants and tagged callicarpa, cerinthe, colored pencil, coloured pencil, drawing, plants, pumpkin on October 20, 2014 by Draws Shoots and Leaves. It’s not that I have not been drawing but I have not been drawing very much, my intentions of drawing every day just flew out the window. The only artistic tool I have had in my hand for the last month has been a paintbrush – a house painting brush. So, what have I done? 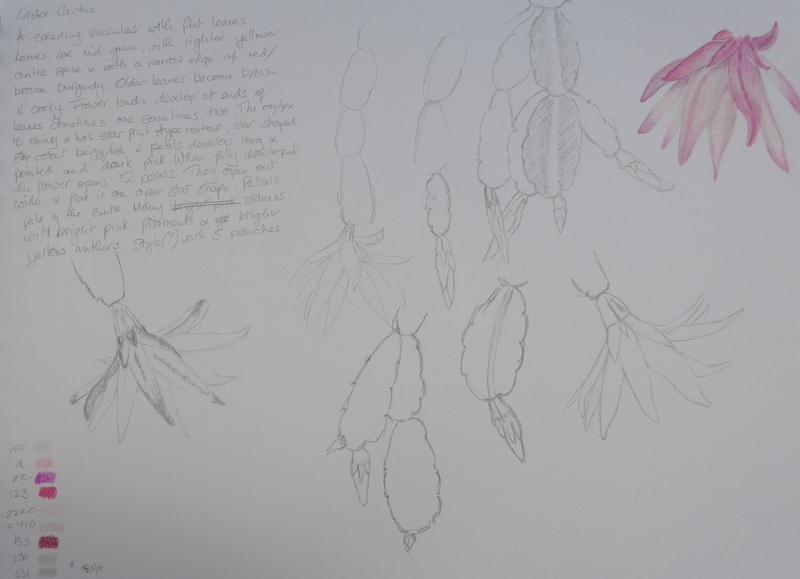 Well on two occasions I was overambitious and started drawings of large specimens which I was unable to continue with or to finish. 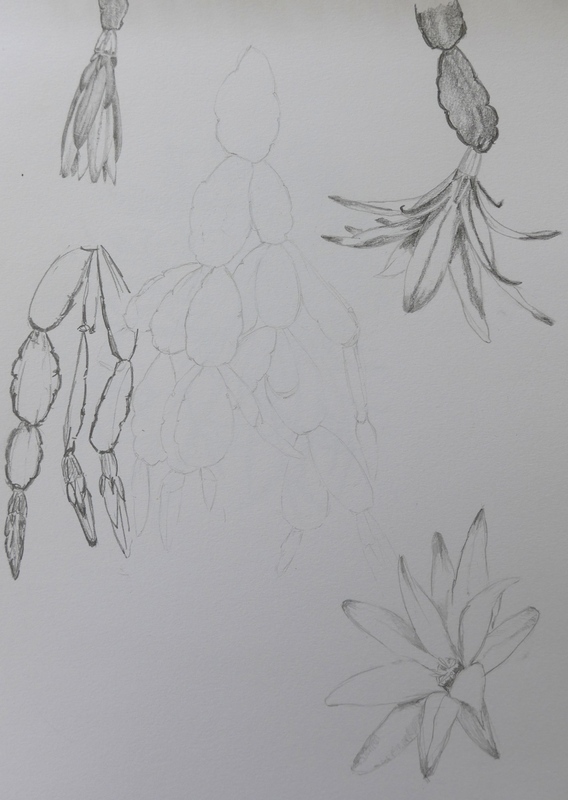 I did not think forward about how my days were going to pan out and then when I got back to the drawing the specimen had shrivelled, withered and I did not have back up photographs. Another good lesson to learn; think hard before starting something ambitious. Pictures attached are very poor as the graphite is too faint for my photography skills and I have over adjusted the contrast. I have just put them in for the record. 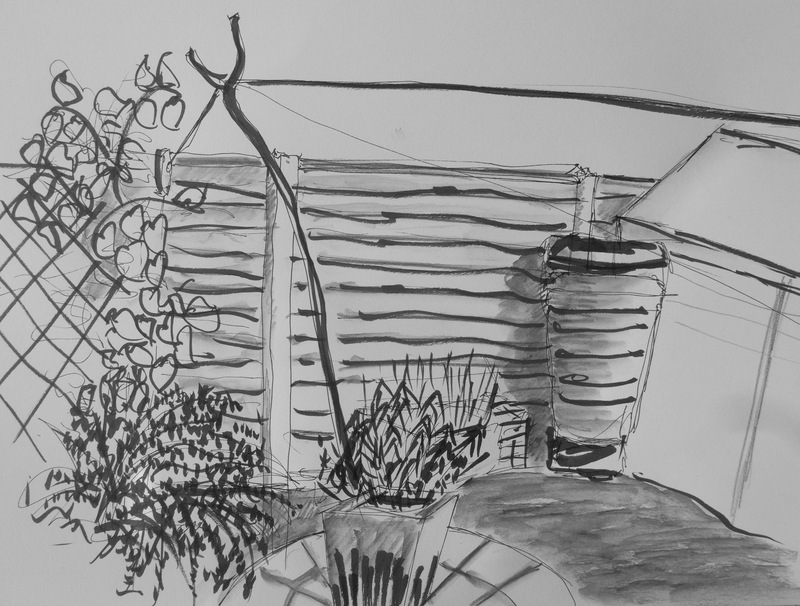 I also had a go at drawing outside again, sitting in the sunshine with the breeze waving the plants around. Good practice at looking and remembering and not being too precious. 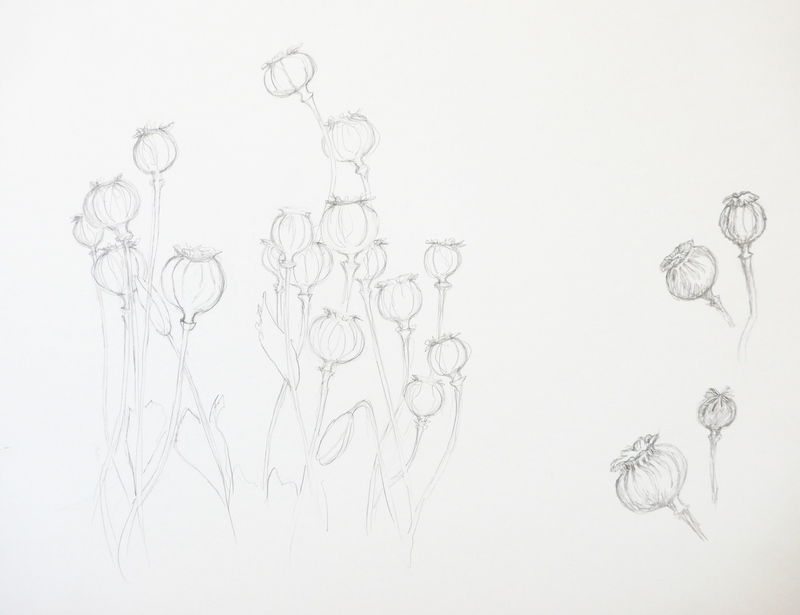 I love poppy seed heads, they are so much fun to draw, seem like little crowds of people. I also had a go at Crocosmia, which actually flowered in the garden this year, it seems to have been a good growing year for many things. This also was a venturing into colour for the first time for a long time – and it was orange again – I have a weird attraction to orange I realise that now……. Again I was disheartened by my efforts, my petals end up heavy and lumpy. 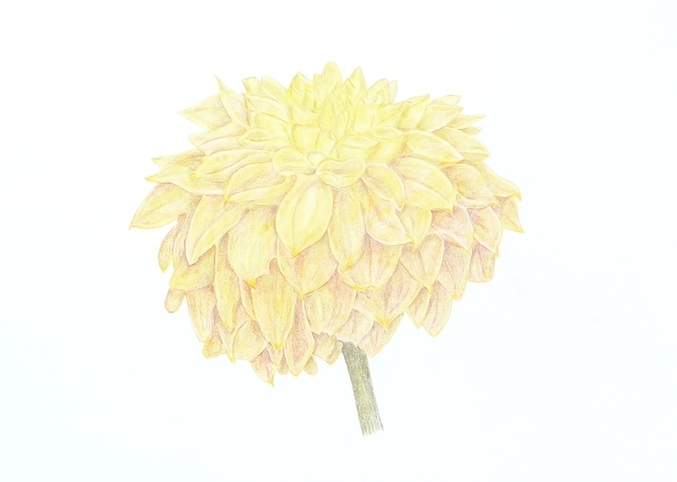 The final drawings I have managed are of a fantastic Dahlia flower that is so luscious in colour changing from apricot (orange!! ), peach (pale orange!!) to yellow with lots of yummy shades in-between. 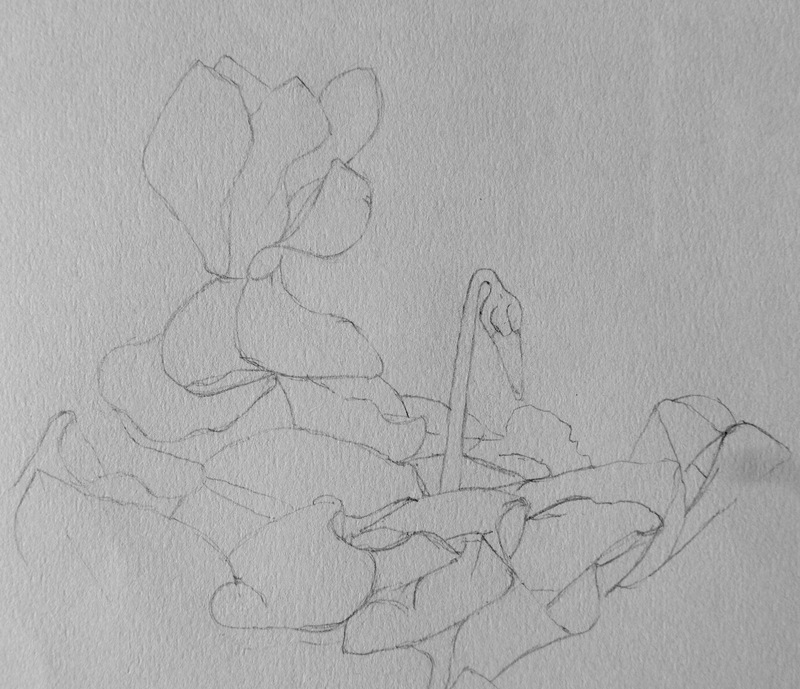 A massive challenge to draw with so many petals twisting and turning this way and that, but that bit went quite well. 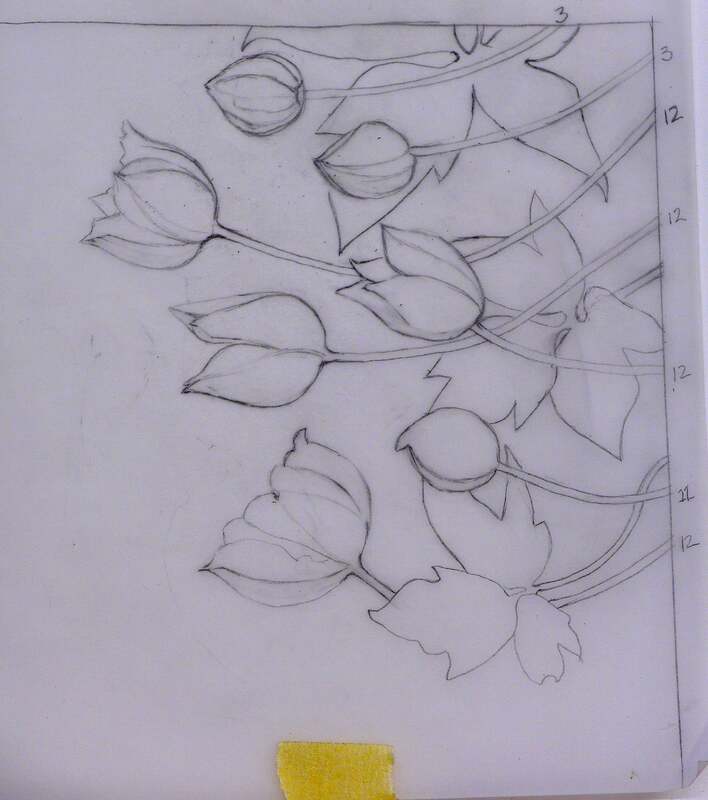 I then traced off my drawing to give me the base for a colour drawing. 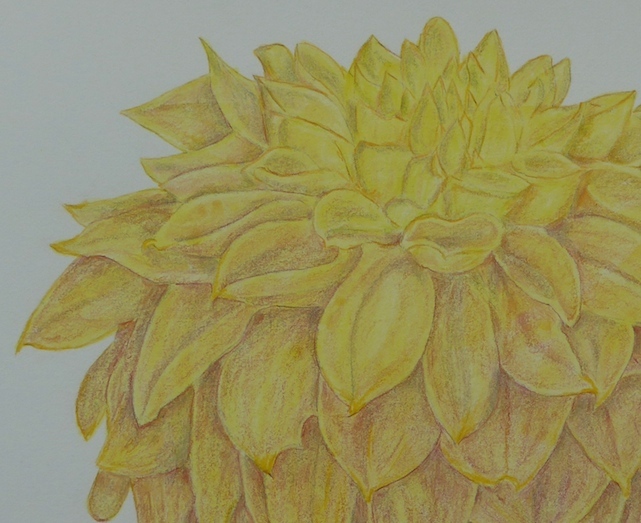 Taking advice from others that have been kind enough to support me I used an underpainting of yellow watercolour to cover the paper before starting with the coloured pencils. The colours are not quite right in the photo so this detail shows them better. But my petals are still lumpy and thick. 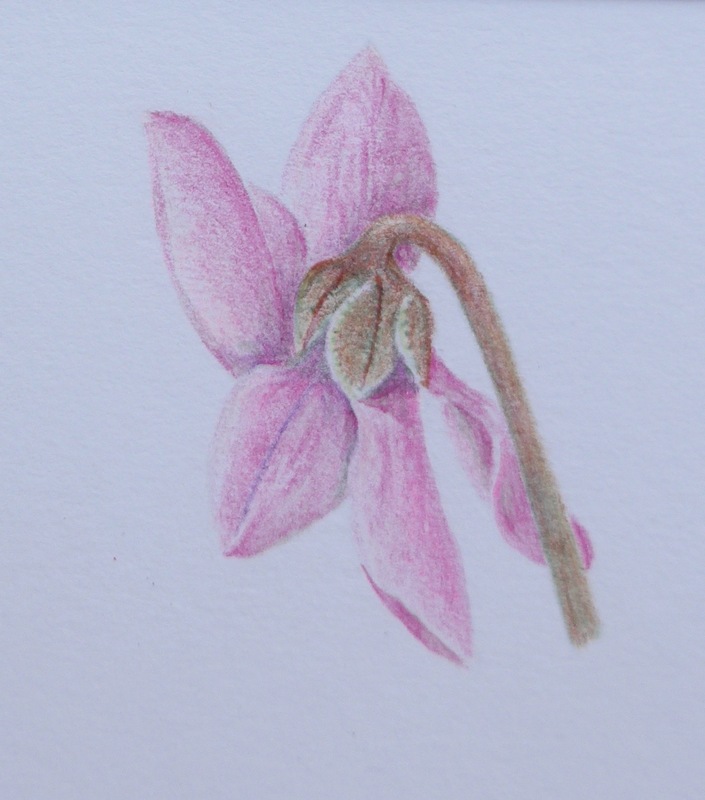 However, excitingly, I am starting a coloured drawing course later this afternoon with Ann Swan who is a brilliant coloured pencil botanical artist and I am hoping to learn loads; whole week of drawing and learning, how lucky am I! 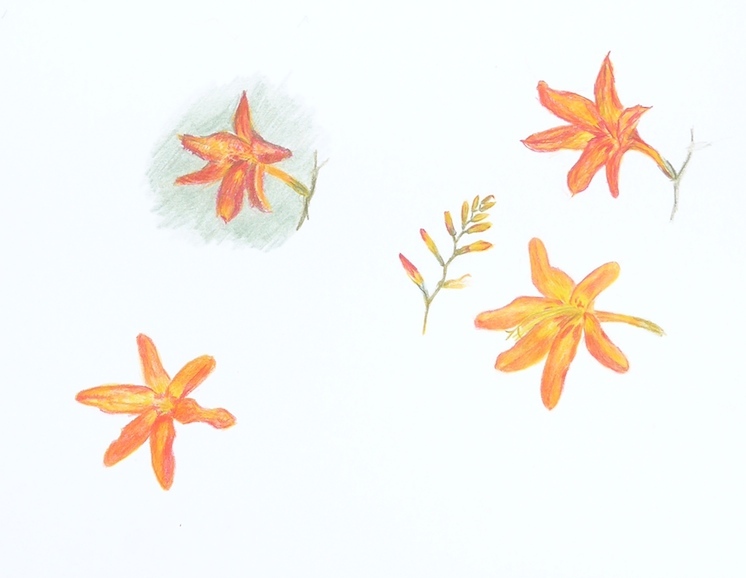 This entry was posted in art, Draws Shoots and Leaves, plants and tagged ann swan, art, botanical art, colored pencil, coloured pencil, drawing, orange, plants on August 30, 2014 by Draws Shoots and Leaves. I hit a low spot last week; took on too much so I felt overburdened and put upon. But action has been taken – I have dropped one commitment and reviewed my attitude to my own efforts (I would hate to work for me, I am a hard taskmaster indeed). But enough of this already and onto what has made it onto paper this week. The one I think I will go with is below, but looking at it again I might change my mind (any comments or suggestions would be appreciated). 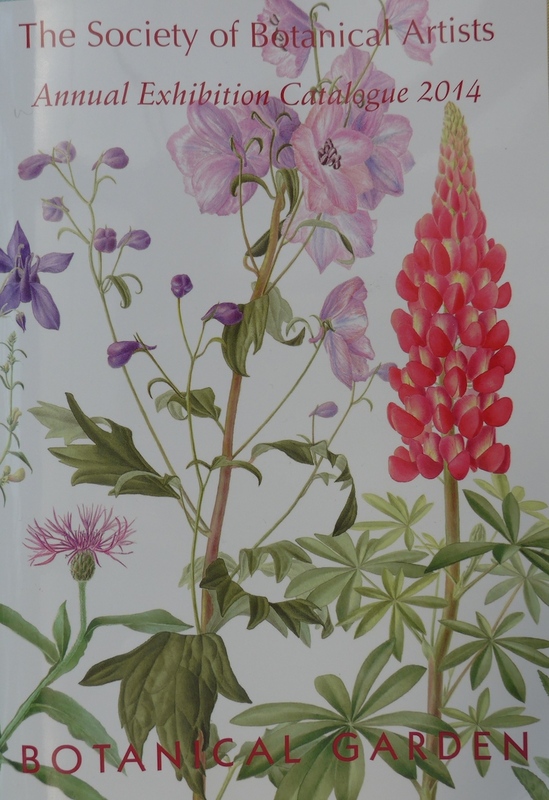 Plant of the week was the wonderful Foxglove; they spread themselves elegantly about the garden in shades of cream, white and maroon, with beautiful markings; just beautiful and enticing to draw. 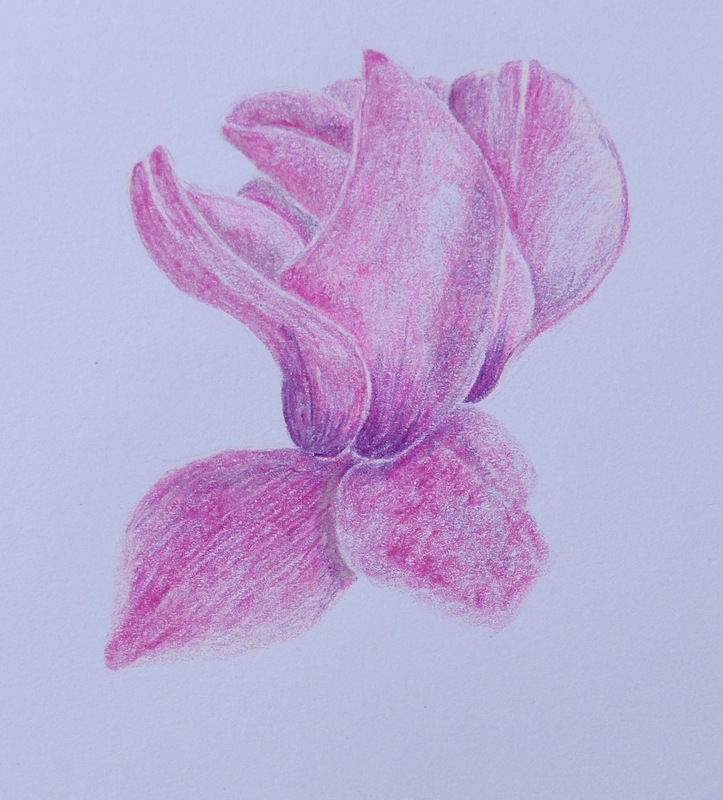 Despite the lush colour I stayed with pencil. 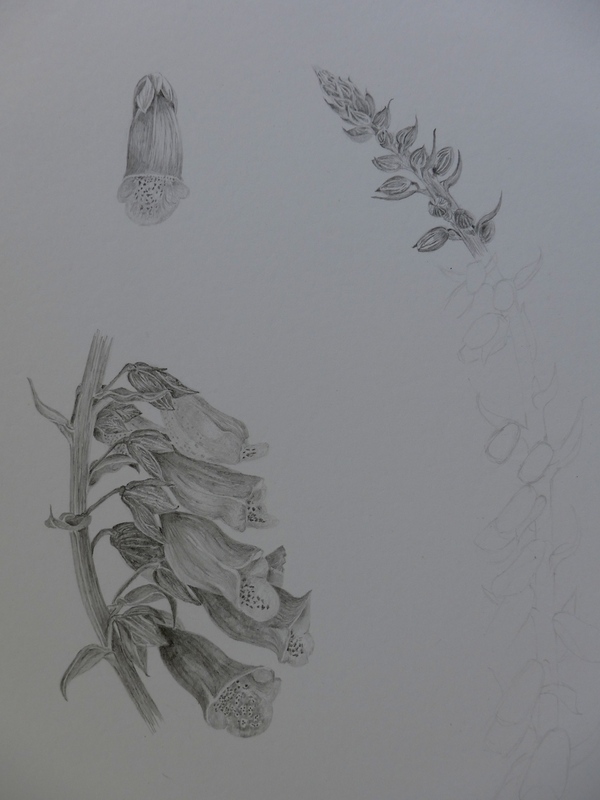 This entry was posted in Draws Shoots and Leaves, plants and tagged drawing, foxglove, pencil, plants on June 1, 2014 by Draws Shoots and Leaves. Well I met my posting target this week, but that is all. I am going to post the four scrubby drawing I managed this week. 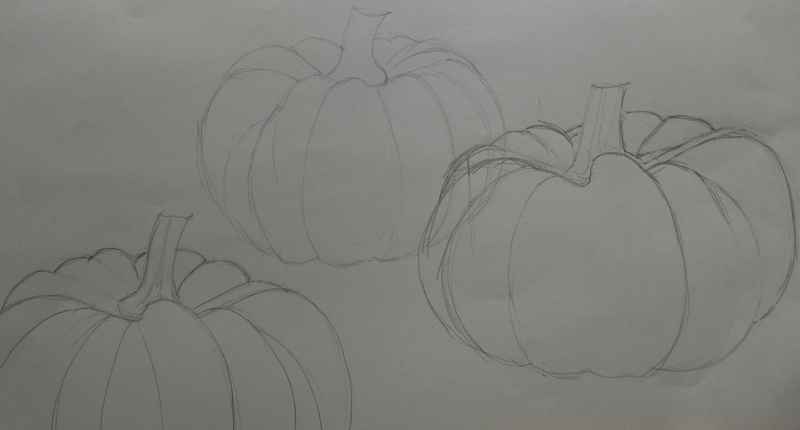 I put them up as the intention of this blog is to share my progress as I struggle to revive my art practice. The best thing that I can say about them is that they have been done. 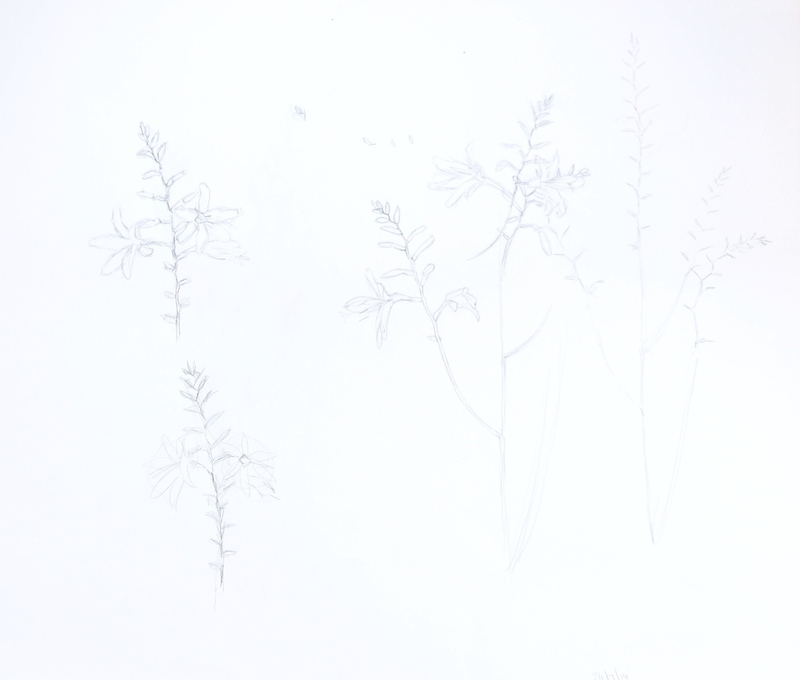 I have managed to hack out a couple of hours and to sit myself in front of a drawing board and start, which is no mean achievement this week. I had another go at the Easter Cactus. 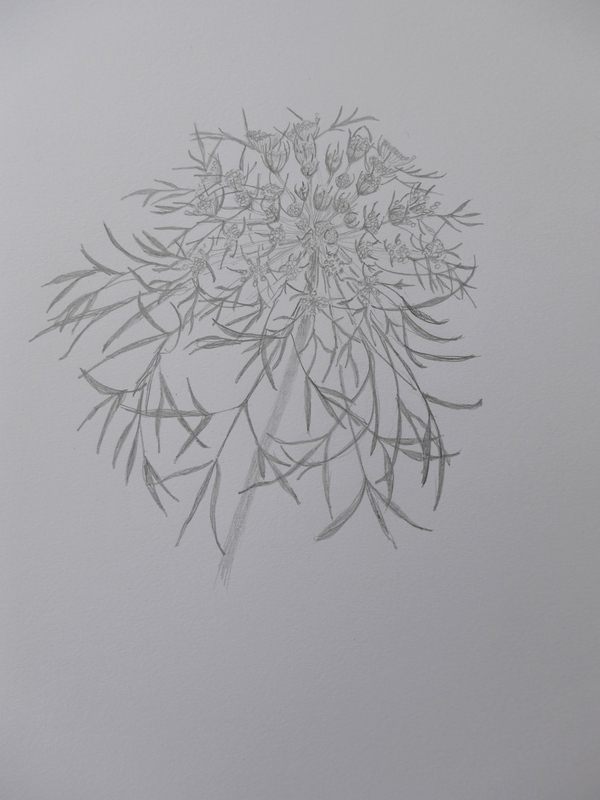 But the plant that caught my eye in the garden was another weed – this time the wild carrot (Daucus carota) a small specimen but bushy and growing well. I read that it is a plant of high summer so that shows how forward the season is this year after the mild winter. 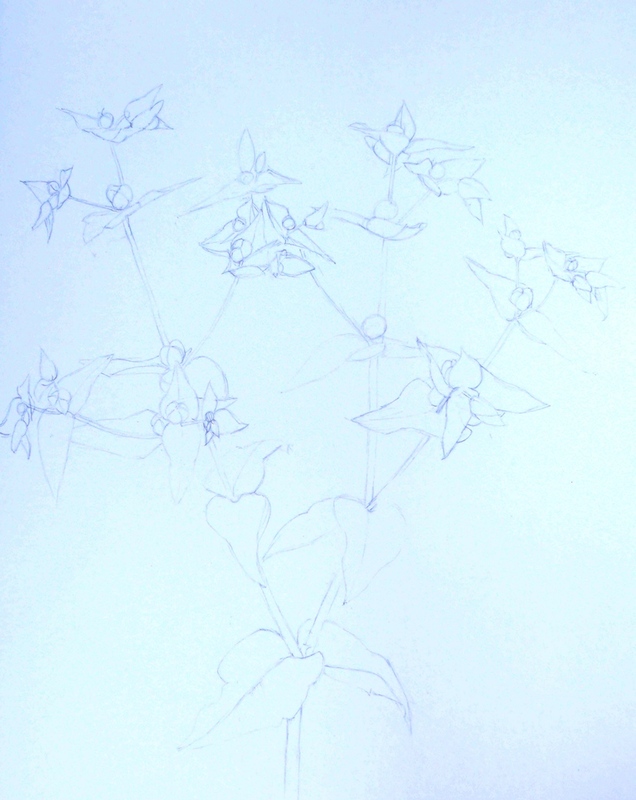 The attraction was the festoon of bracts beneath the flower umbel so I had a good scribbly go at them. 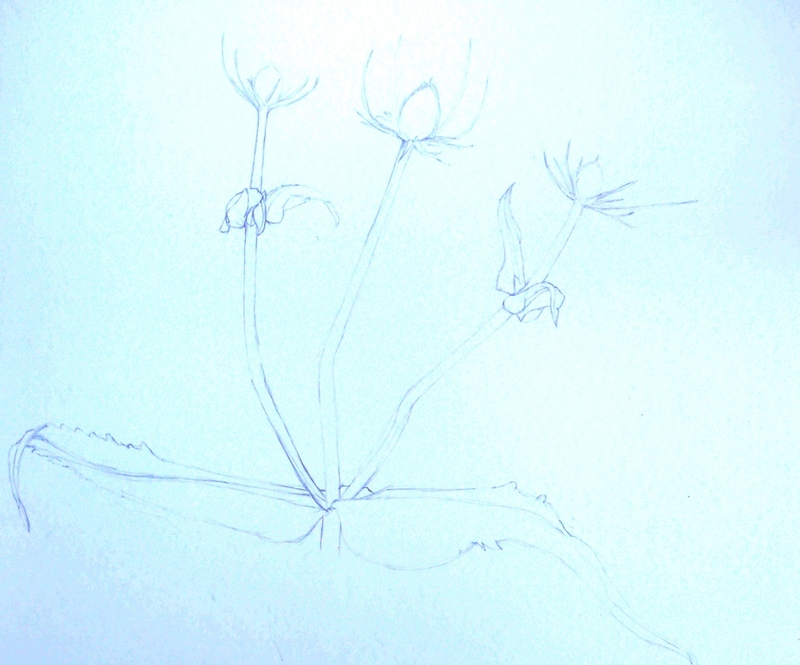 And finally this afternoon I attempted a more detailed sketch. 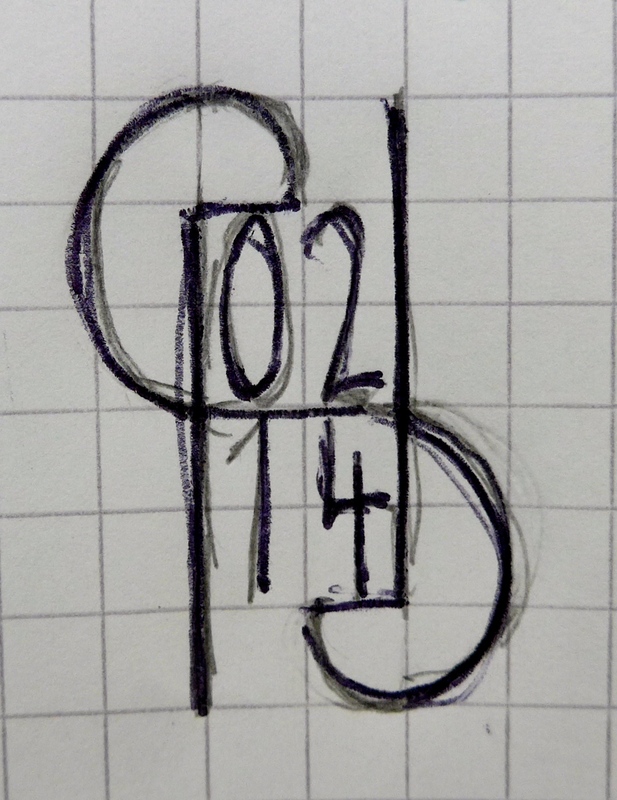 This entry was posted in Draws Shoots and Leaves, garden, plants and tagged drawing, plants on May 24, 2014 by Draws Shoots and Leaves. 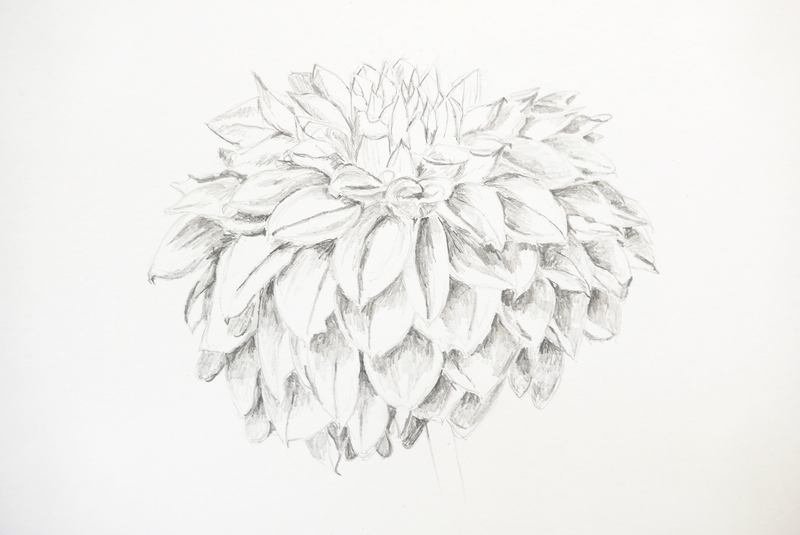 I went by myself to a Botanical Art exhibition, ‘how sad’ you say, but no it was great, it was just what was needed. I had no one to talk to, no distractions, no worrying about if someone else was bored, tired or hungry, needed the loo or just wanted to go home. I just had myself to please and somehow that does not happen very often. I was able to go around the show which ran to nearly 700 pieces and look at each one individually. 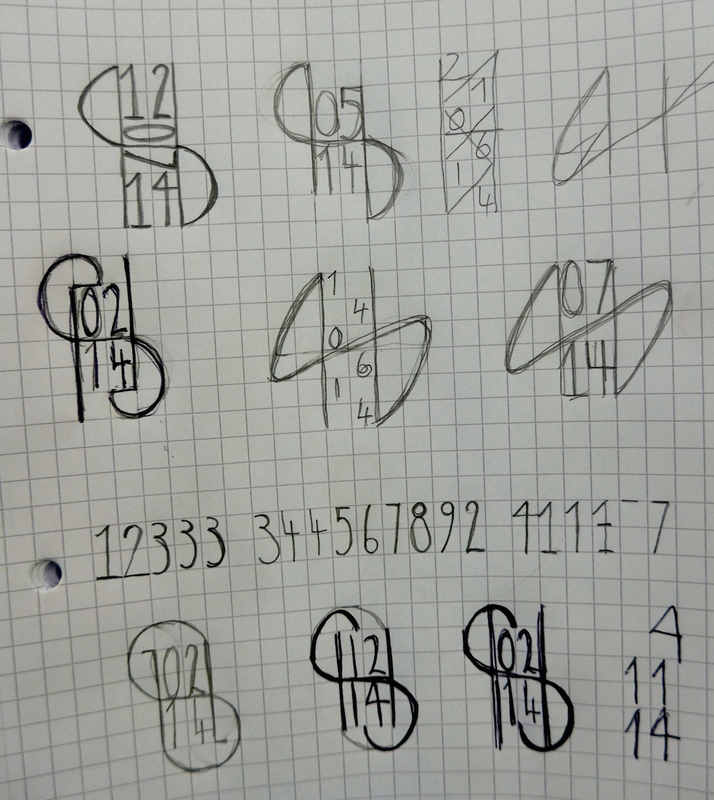 I treated my visit as a learning experience and decided to analyse the pictures I liked and to decide what it was in that image that ‘spoke’ to me, and then I took notes (nerdy or what?) Still I was there by myself so I could please myself! 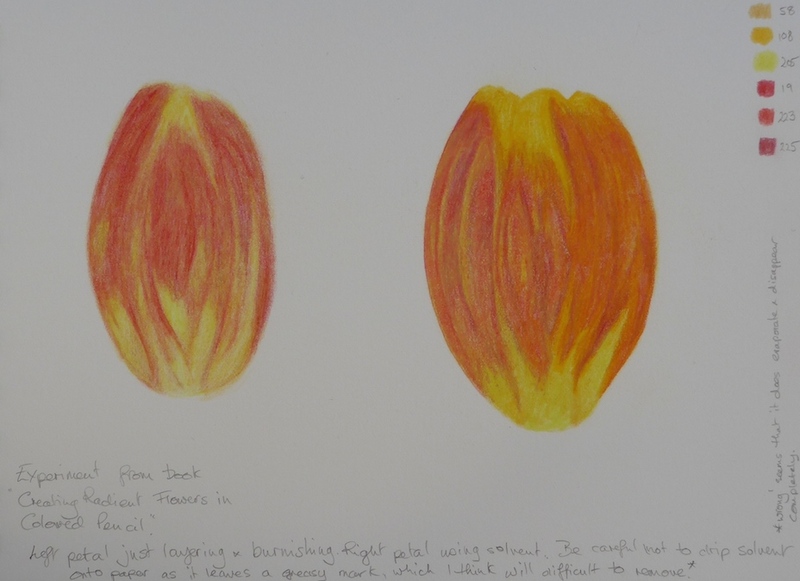 I also noticed that some subjects are just ‘done to death’ and however beautiful and clever the work there is really nothing much new to say about strawberries, peppers, conkers, aubergines, tulips, daffodils, onions, garlic, carrots, cherries, orchids, iris, violas………….. I could go on. That said, I’m sure I’m going to have a go at all of these over the coming months. Some amazing work in the exhibition and so many talented artists. 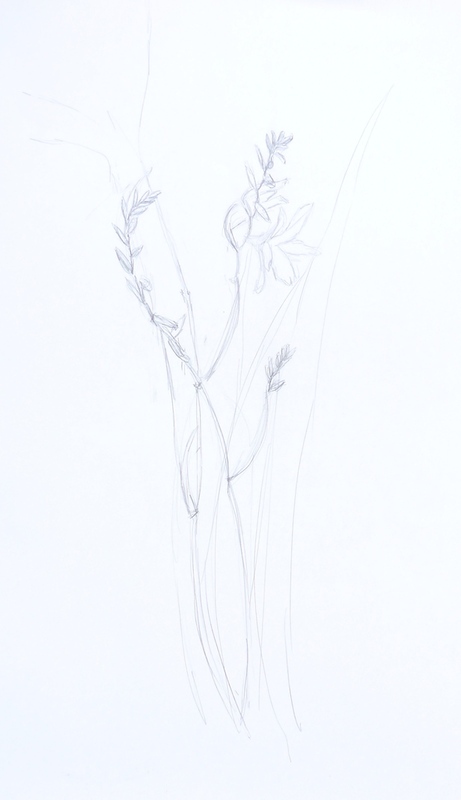 Back at my own drawing board, things are not so amazing………. 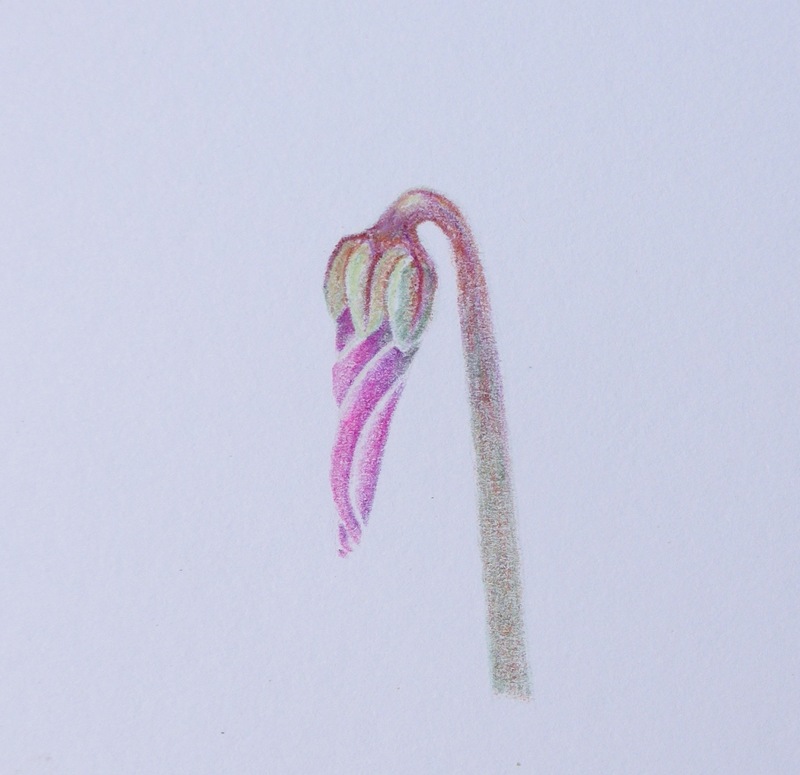 This week I followed instructions from a book called ‘ Creating Radiant Flowers in Colored Pencil’, this had instructions about using solvents to dissolve and blend coloured pencil. 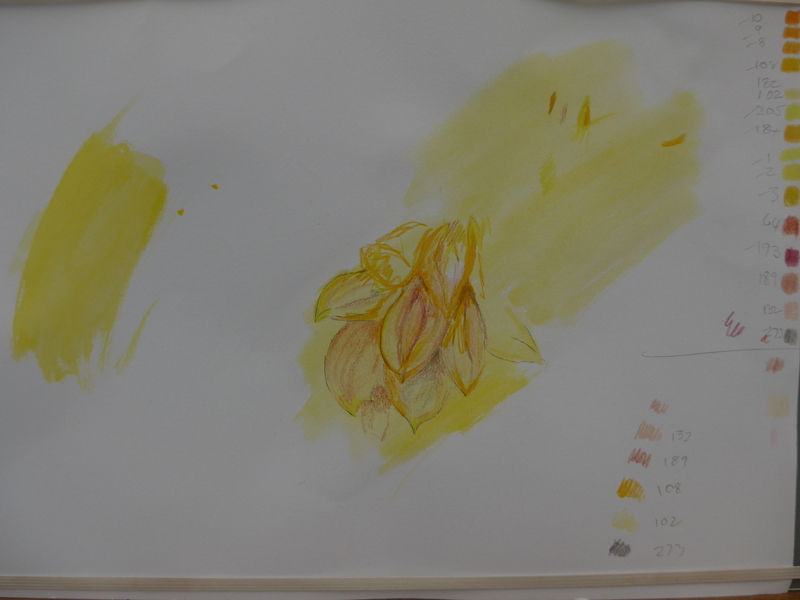 First petal is just blended/burnished pencil and second one has had solvent applied to blend the colours, not only is it bigger (not caused by solvent but by operator error) but it is brighter, so I guess that is one way of getting really intense colour. Then I went onto my plant of the week, which this week is my flowering ‘Easter’ cactus, this flowers for me every year and survives on neglect. 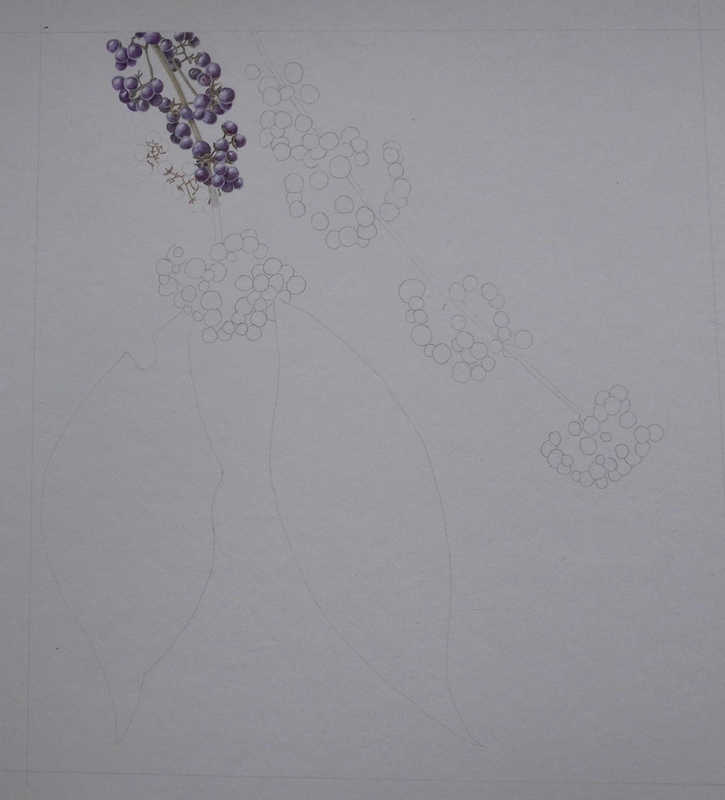 Have not put much time into it but I did try to have a go at the flower, pale pink almost white in places, how do you draw white petals on white paper? Another skill to learn – to be added to the list. 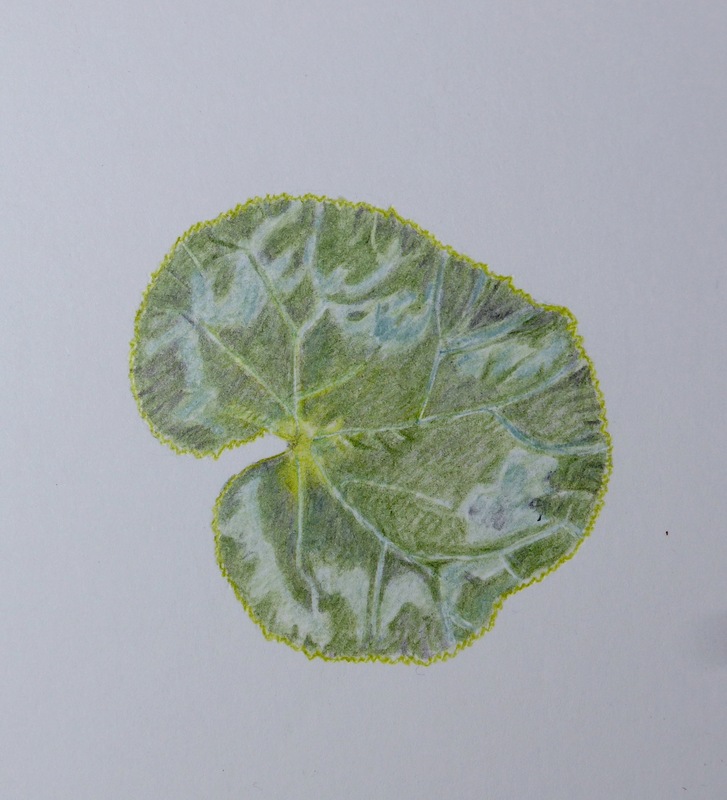 This entry was posted in art, Draws Shoots and Leaves, plants and tagged botanical art, colored pencil, coloured pencil, drawing, exhibition, plants on May 17, 2014 by Draws Shoots and Leaves. In which the author meets a virtual internet friend in real reality and spends the day in London. 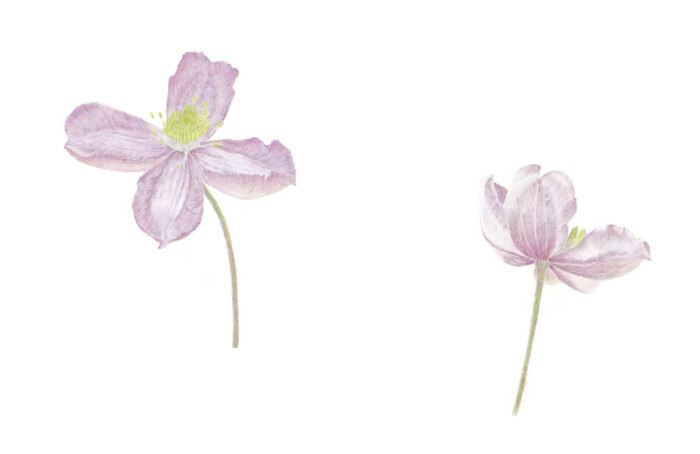 Even with all the excitement of London and Dedham I did get some drawing done, and this week what interested me was our Clematis Montana coming out, it seems to be best ever this year, maybe all the rain last year helped. 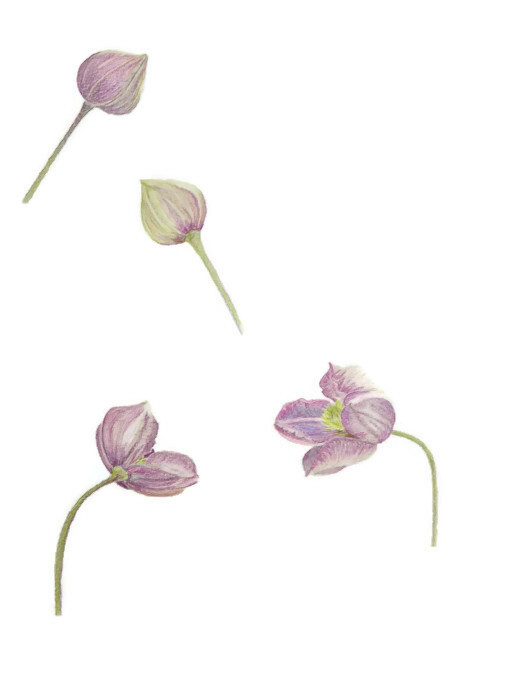 Petals again, oh dear, but practice makes perfect so I had another go. 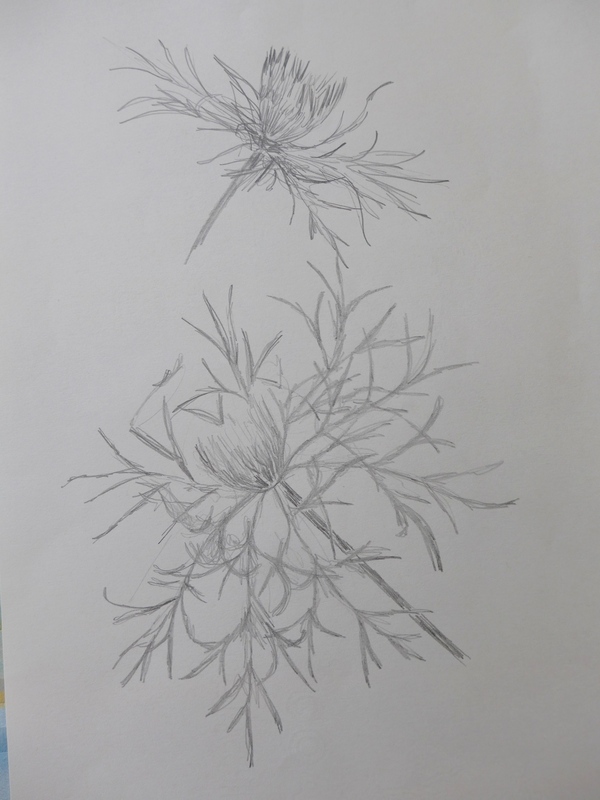 So it is all very well being able to draw a plant fairly accurately, but what I realised at the exhibition this week is that accuracy does not an ‘artwork’ make. Well, that’s obvious, obviously but it had not really sunk in; but visiting this class I could see that although the plant material was there the students were using it as inspiration rather than a guide. 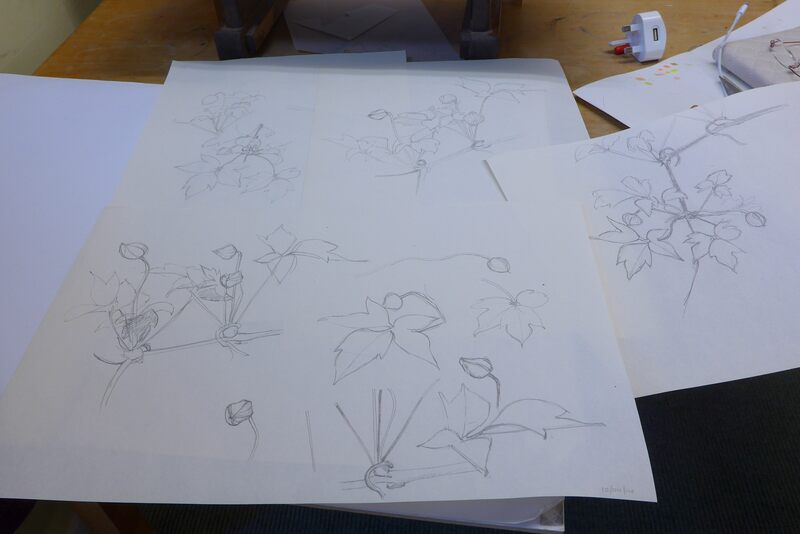 So having done my preparatory drawings and photos of the clematis I thought I would have a go at ‘composition’. I therefore spent a happy few hours with tracing paper, IPad, drawings, scissors and eraser laying out my first composition. What I had noticed when I photographed the plant was that all the buds looked like little faces searching for the sunshine, so I tried to get the feeling in my picture of the buds and opening blossoms straining towards the warmth. Not sure if it has worked but I am going to go with it, it is only small (a finished size of 6 inches square). 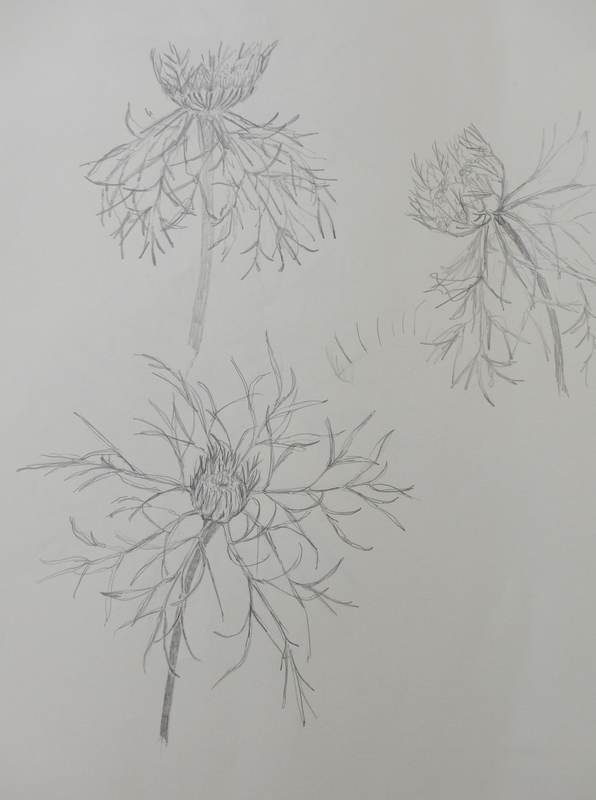 This entry was posted in art, Draws Shoots and Leaves, plants and tagged art, botanic, botanical art, clematis, drawing, plants on April 19, 2014 by Draws Shoots and Leaves.